Easy, breezy. 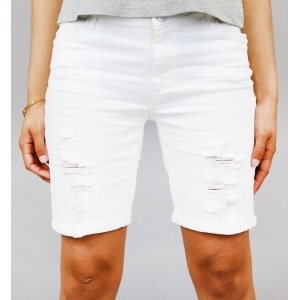 Welcome warm days in style with these juniors' Candie's jean Bermuda shorts. Destructed details Frayed hems 5 pockets Stretchy denim construction FIT &amp; Sizing 11-in. inseam Midrise sits above the hip Zipper fly Fabric &amp; Care Cotton, rayon, polyester, spandex Machine wash Imported Size: 1. Color: White Oth. Gender: Female. Age Group: Kids.